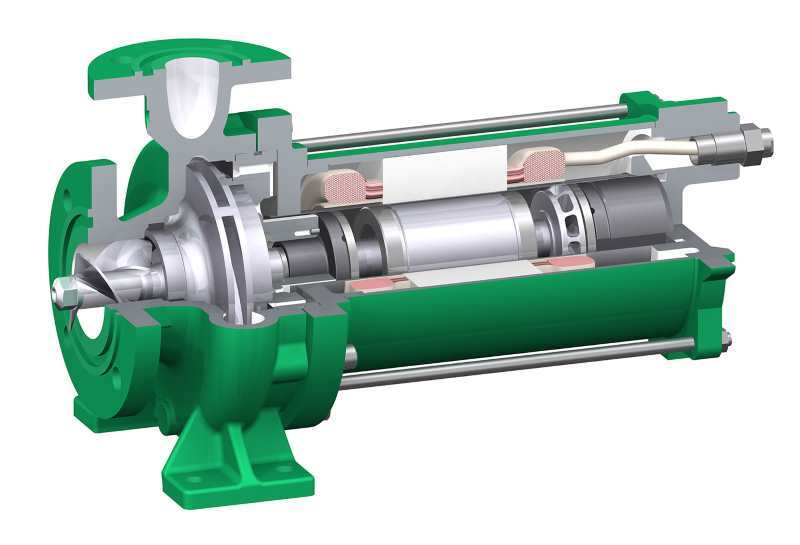 Hermetic-Pumpen has developed a comprehensive product series with which the company can satisfy practically all its customers’ requests but with shorter lead times. The ranges of canned motor pumps provide the basis for individually configurable pumps that, thanks to the huge number of possible combinations of the individual modules, are available in around 700,000,000 variations. Hermetic canned motor pumps are designed for extreme conditions and guarantee the utmost reliability. With this new series for the chemical industry, an innovative technology offering optimised reliability will be shippable more quickly thanks to a new production line and standardised production processes. there is an enormous selection of combinations. Pump users can also choose from up to four different gasket types and flange connections. The drain connections, inducer and monitoring devices (temperature, filling level and axial thrust), and the transport protection all offer further choices. The resulting unparalleled range of models that Hermetic-Pumpen has developed can satisfy practically every customer requirement. 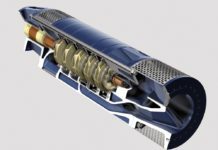 The utmost reliability in pumping critical liquids using canned motor pumps can now be achieved in a few months. “Thanks to the different module combinations, we will now be able to produce large numbers of canned motor pumps relatively quickly. They are designed for every possible application in the chemical industry and can be adapted to practically every customer requirement,” said Boris Sander, head of Product and Application Management. “With this modular series, our aim is to respond even more effectively to the need of our customers around the world for short and reliable delivery times. 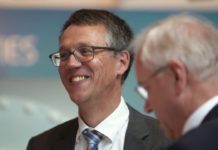 We have been guided by market needs and processes in developing this series, and have organised established pump / motor combinations in a performance grid based on customer surveys and market analysis,” continued Sander. In addition, Hermetic-Pumpen will already make the engineering documentation available at a large stage for every combination in the product series. So plant engineers will be able to draw up their plans in good time. All the sectional and dimensional drawings, together with detailed data sheets, will be available for final planning. Detailed information about the monitoring equipment and control technology will also be available, together with the performance characteristics of the pump and motor. With its new production line, Hermetic-Pumpen is able to provide tried-and-tested components quickly and transparently thanks to an intelligent modular system, and support customers through faster processes and better spare-parts provision. Risk prevention and maximum reliability in demanding pumping tasks in the chemical industry are the basic principles behind the technology in Hermetic canned motor pumps. More and more stringent environmental protection guidelines are constantly increasing the industry’s safety requirements. Thanks to its reliable and practically maintenance-free pump technology, innovative developments and outstanding service, Hermetic-Pumpen is now the internationally recognised partner in the standard sector of pumps for highly sensitive liquids. The double containment shell of Hermetic canned motor pumps offers an absolutely reliable protection against accidental pump leakage. Furthermore, this time-tested construction design does away with shaft seals, and conventional bearings and couplings. The result is high operational reliability and minimal wear, and therefore a high mean time between repairs (MTBR). 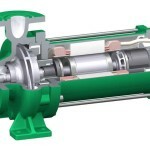 Hermetic pumps find their application where conventional technologies reach their limits. High system pressures, severe temperature fluctuations and the most challenging pumped media: Hermetic pumps have been developed for just such extremes. The modular series of Hermetic canned motor pumps for the chemical industry can be used with any toxic, carcinogenic, explosive or simply extremely valuable material. They are equally suitable for hot water and liquefied gases.